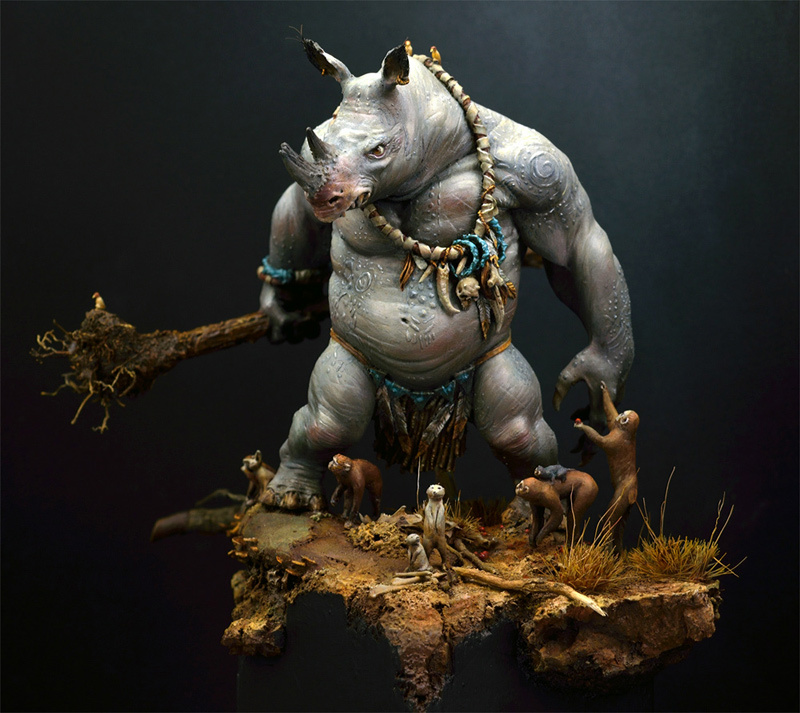 I was painting Allan Carrasco's Rhinotaure, version 1, lately. I had my issues with the skin. While I was working on those massive areas of skin I felt a bit lost when it came to painting the detail light work on it. It was just too big and I did not want to use the airbrush on it. Don't ask me why. So I thought about some War Paint on the model. 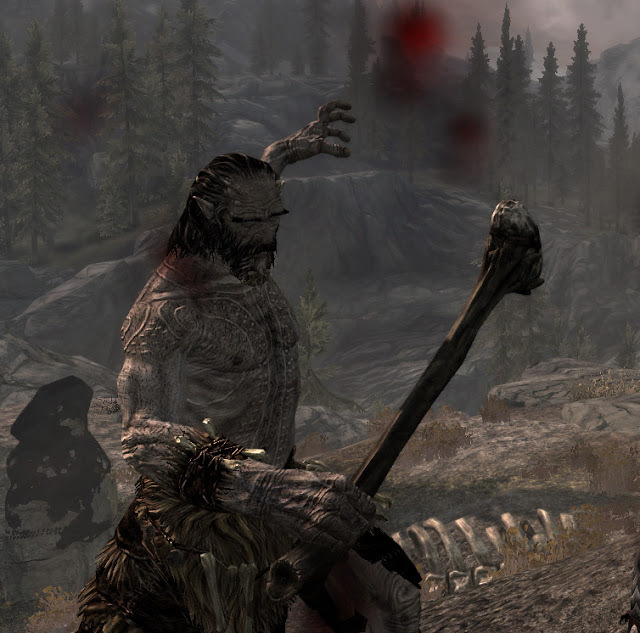 I had this thought in my mind but switched the idea because of something I never thought of in the Computer Game "Skyrim". if you like the beat of the jungle drums and the inspiration you find here. Many thanks to those who support the jungle. 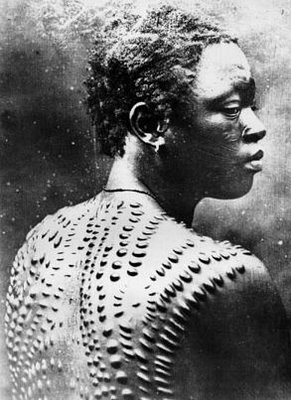 A giant having Tribal Scarification in his skin. So now everybody knows the giant way of body art. 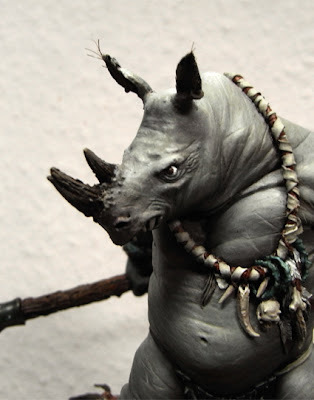 I thought about doing this on the Rhinotaure as this proud warrior of the animal clan has to got the look. 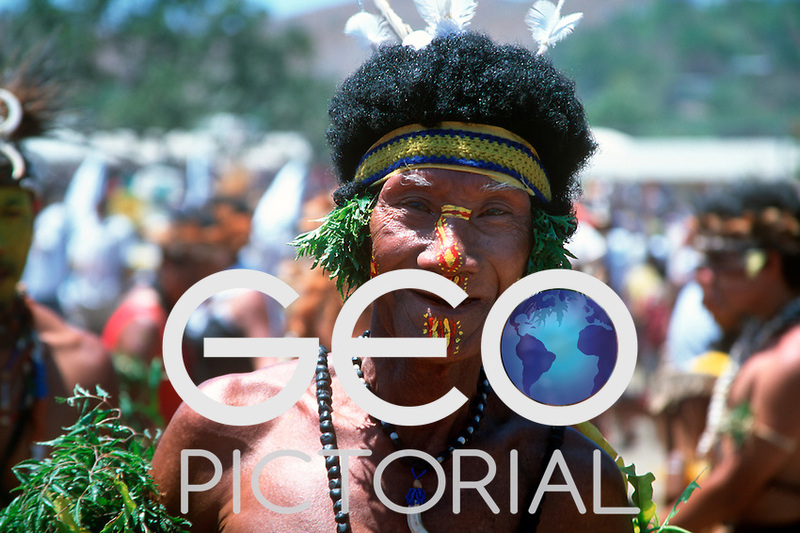 The look of a chieftain amongst his folks. The look of the brave warrior he is. So why not go the way of doing some scares, that shows that he feels no pain and will warn all the Tribe's foes of whom they are dealing with. I was checking references first. Here, here and here you see my search results. I decided to add the scars to skin by by "sculpting" them. They should have some volume like real scars would have so I could paint that little lights on the real thing, not the illusion. For sure I could paint them on the model, but in the end it might look like Warpaint again. I prepared some Vallejo Putty 401 to mix it with some grey colour. 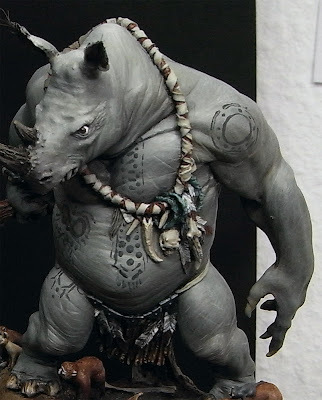 I used grey in this case as the main colour of my Rhinotaure would be grey. That means if you are doing it on a human skinned model you should mix in some flesh tone. 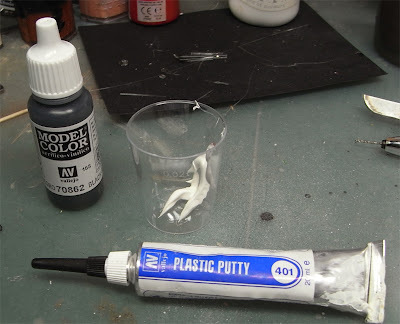 You can also do this with liquid green stuff I assume, BUT before Priming, not during the process like I did. Make sure you mix it well. If you don't you will get different hued greys on the tribal scars you are applying and that is very confusing if not controllable. Take your time. I did not not add a drop of water as this would thin my paste. I want to create Volumes. I took the toothpick number one (in the end I did need a lot) to take some of the paste and put it on a pad and checked it before applying it. I made some tests on some old colour bottles to check how it will work with the toothpick, how I can handle it and how it sticks to the surface. I've researched that the toothpick works well, but mostly for dot scars. When it comes to scar lines I have used a brush with a good tip and painted the volumes carefully. I did this over the whole body and was not scared that my grey looked a bit too dark. I already was a thought ahead and knew that there has to be much light and shadow work on the skin later on. I just dropped in the Trbial Scarification as an element that makes it easier for me to get it all together in the end. Make sure to clean your brush regularly or it will dry to stone. I have apllied it for several times and let it dry, as I felt needed for the different volumes. Bigger scars - bigger volumes. This was not a good idea at all. I got mad about redoing the same thing at the exact same spots and was already rethinking my good idea, but I was holding on and madness got me covered in its dark fog for several days. I did it over and over again and searched for places on the Rhinotaure to add some tribal scars. After I did them all I was pretty happy to switch back to the brush and colour again. 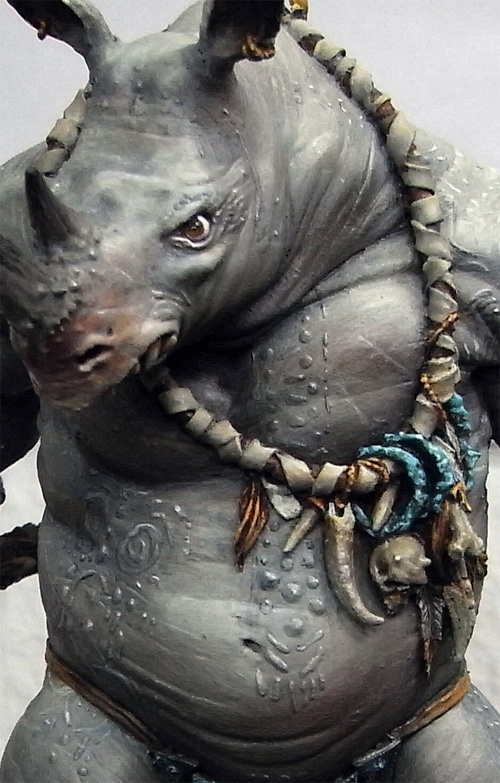 I first decided to work out the contrast on the Rhinotaure's skin at the big areas as I needed a break from all these tiny volumes. 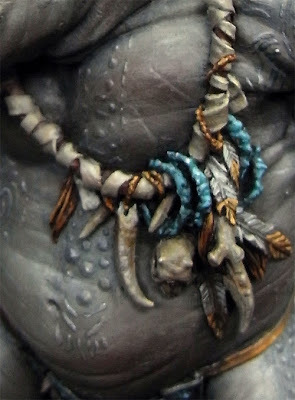 So in the following pictures you will see the overall painting on the model improve and rise. The Scars did just become a piece of the puzzle and a part of the progress. While I was painting the bigger areas I started to put some tiny lights on the tribals, whenever it was possible because of the brighter grey I had in my brush from working. I did this again for several times and it wasn't that cool again. First I did it rough. 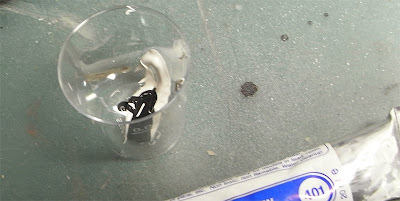 In the end it was all blend together with the use of Oil colours. Blending with Oil Colours lead to the loss of some of the light dots. Still all work in Progress so it looks roughly here and there. detailed and concentration assuming work. But I was up to not give ground to evil thoughts of just stopping it now. In the end the final result looked like the following photo and took me way too much hours that made me hate the figure when it was done, honestly :D - but I think you could use this technique for sure on some gaming Barbarians with smaller areas of skin. I think some small tests in front before going straight to an important model of yours should be done - just to get the feeling. You can find more photos of the finished piece here! Fantastic result and I love the attention to detail you put into the model. Just one word : impressive ! thats a piece of real art my friend! You broke my head with all your strange and beautiful experiments! Amazing, from the draws to the final composition. You're a master bro! I really would like to enjoy some painting seassons with you, hand to hand to share technics and ideas! Keep painting! Amazing. 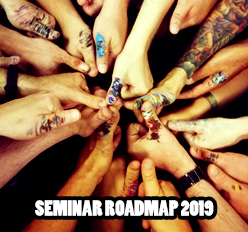 Can't wait to see your masterwork in person this July...Tim from DC. Hi Roman, one of your best works i have seen. For me its more than a 10! congratulation! Many thanks for your comments - I am really happy that you like him and the article. Check todays Jungle post for bigger and more photos of the finished piece. 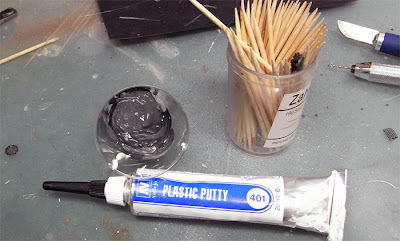 - You can also do this with liquid green stuff I assume, BUT before Priming, not during the process like I did. Wow, been following your progress on this mini and it has turned into a real masterpiece. The "3D" warscars are something that I have seen for the first time in a miniature. Yes, it took a long time to do it, but boy was it worth it!